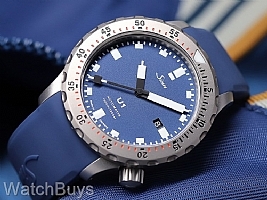 We love asking Sinn to produce special limited production watches, and as soon as we saw the new Sinn U1 B (Blue) we knew that we wanted them to produce a Sinn U1-T B with a fully Tegimented case with your choice of a Sinn black or blue silicone rubber strap and fully Tegimented diver's locking buckle. Once the case is complete, the Tegimenting process begins, and when we say "fully Tegimented" we mean what we say - case, crown, bezel, case back and the buckle. This watch is fitted with your choice of a Sinn blue or black silicone rubber strap with a fully Tegimented Sinn diver's locking buckle.